The Paradox studios in Muscle Shoals were among the smaller operations there but they still issued a dozen or more 45s. These were mostly country or pop but Bill Cofield and Jim Thomas did record some soul via artists like Charlene & The Soul Serenaders and especially Roy Abernathy. He had two 45s on the label – both now very difficult to find – which showcased his beautiful country soul stylings, rather reminiscent of the great Percy Sledge. Abernathy himself penned all four of his issued titles and fine songs they are too. Come On And Love Me is a gentle ballad with some tasteful piano and guitar fills and lovely double tracked vocals, and when the horns come in midway through you could almost use this as a perfect illustration of what the term country soul means. The flip Love Is A Cheating Game is more of the same – another delicate 12/8 tune with a good melody and rather more emphasis on the horns. The lyrics tell a tale not dissimilar to Percy’s “Take Time To Know Her” – and I could listen to music like this for ever. 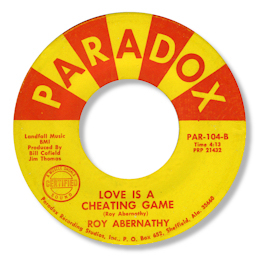 Abernathy upped the tempo for his second Paradox single both sides of which I also rate pretty highly. 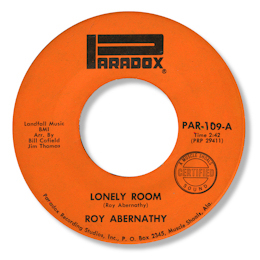 Perhaps the better track is the easy swaying “Lonely Room” with it’s country changes and strong horn charts. I wonder if there is more music in the can from Mr Abernathy? Special thanks to Peter Hoogers.